Mai was in Amritsar with her husband, Mani, and thirteen year old son, Sandeep, at the time of Blue Star. This account is from her personal blog, sometimes - 2. It appeared in slightly different form earlier in this blog. This is another story I had not intended to tell publicly, but the family have prevailed upon me because, they say, it's a great story, and might actually give someone some encouragement someday. So here goes. I have cleaned up the story and the language considerably, since I want to keep my blog at a PG-13 rating. It was a lot rougher than I have actually written it. June 4, 1984. We had been in Amritsar since mid-May, visiting relatives, of which we have many in that area. 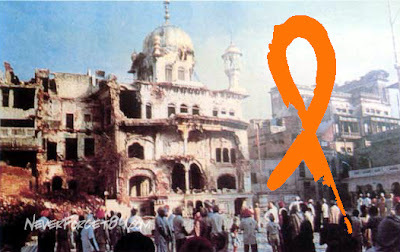 The date, for those of you who don't recognise it, was the beginning of Operation Blue Star or more properly, Ghallughara, when the Indian army stormed the Harimandir Sahib (Golden Temple), looking for 'terrorists.' They found thousands of people there commemorating the anniversary of the shaheedi of Guru Arjun Dev Ji. They opened fire on the whole complex, and killed, who knows how many. Fortunately, we were at a cousin's house when it all started and thus were safe, or so it seemed. No such luck. Two days later, the police barged in and took us all. Fortunately, as it turned out, the three of us had our passports on us. I'm not sure exactly where we were taken, a police station somewhere. They separated the men and the women; I was afraid that that was last I'd see of my men. Then t hey put each of us women in different rooms. And I waited. For the first time in my life, I was really scared. After a time, a very young policeman came in. Although my hands were bound behind me, I managed to pull out my Canadian passport. 'Are you Sikh?' Smiling slightly. 'Yes. I'm Khalsa.' Blood was coming out of my mouth. I wish I could say I was unafraid, but that would be a lie. A BIG lie. I have, to this day, never been so terrified in my life. But I managed to keep my voice steady. He reached over to me and tore my shirt off. Then he pulled out my kirpan. 'The little Saint Soldier has her little knife, I see.' In a sarcastic voice. He drew the blade across my throat. I laughed nervously. A strange reaction. Unlike most Sikhs, I usually do not carry a blunt kirpan. I know, I know. A kirpan is a religious article, not a weapon. I'm sorry if I offend anyone here, and I know I will, but I have never believed that our f ather Guru Gobind Singh Ji intended us to be unarmed. I usually carried a razor-sharp medieval French war dagger that had belonged to a lady ancestor of mine. I suppose it couldn't really be called a kirpan, but it was what I carried. I'm not sure why that day, I didn't have HT, my dagger, on me. If I had, I would be dead. So I laughed nervously. The result was instantaneous. I was not afraid. I was not in pain. I don't know how I knew they wouldn't dare cut my hair; I couldn't care less what else they might do to me. My dad's words came to me: 'No one can humiliate me without my consent.' I laughed. 'I'm Khalsa.' I looked at the mirror across the room. I'm not a complete idiot. I know mirrors in interrogation rooms are one way glass. And I was certain that the cops were forcing my son and husband to watch this. Sadistic f* cking bastards! I nodded to my unseen men and smiled. He slugged me in the stomach. It didn't hurt. He slugged me like that several more times until he finally knocked me off my feet and I fell to the floor. I have never felt so calm and complete, as strange as that sounds. I was completely unafraid. He stood over me and [stared at me, now completely naked, lying on the floor. He kicked me in the head repeatedly. Then, he pulled me up by my hair and with the help of his colleague sat me in a chair. He cut open a hot chili and rubbed it all over my face, up my nose and into my eyes. I didn't react at all. He glared at me, with pure hatred. But he stopped. The second cop untied my wrists. [So what was going on in me, while he was torturing me? (I believe this does qualify as torture.) I could see, hear and feel everything that was going on. But I felt no pain, either physically or psychologically, then or later. Instead, I was aware of various voices singing the Mool Mantar, over and over. It was the most beautiful thing you could imagine. It completely transported my being to another level where pain simply doesn't exist. This was the second time something like this had happened to me in this life - and it has not been repeated since. [I was operating in two completely different states of being. All of my senses seemed to be in overdrive. My hearing was enhanced. Colours were vivid and alive. I was fully, completely conscious and aware. I want to emphasize that I was not being brave or strong or heroic. And I am not masochistic . I was as calmly joyful as I could ever imagine being. It simply made no difference to me what they were doing. Why do I think this happened to me? Because I relied on a promise made by one who was a father to me. There is nothing special about me in this. Any Khalsa in this position has the right, perhaps even the obligation to do the same. No special, secret words, no silly rituals, just the total intention. There is much more I could write about Amritsar at this time, the smell, the heat, the noxious insects, the sacred sarovar filled with blood and dead bodies, but that can be found elsewhere on the net. I'm trying to record only my personal experiences. Punjabi police do not mistreat women unless they are close relatives of terrorists or suspected terrorists. The first presupposes that the underlings who were first in charge of us would care about such niceties as international relations more than they would care about the pure pleasure of tormenting us. I will point out that as soon as someone in charge realised that foreigners were being worked over, they were ordered to stop, orders that were immediately, if reluctantly, obeyed. But totally insulting to me is the implication that I am not the close relative of someone involved in the Khalistan movement - in local police language, a terrorist! How dare he imply that my family accepts the yoke of the Hindus, the perfidy of Mr. Gandhi and company. Now is it clear to everyone why I decline to identify my family? There are a couple things that I personally wonder about, though. As foreigners, why were we not quickly escorted out of Punjab? Or why didn't we disappear? They must have known that we would eventually tell our story. And why did they just turn us lose. Unless I am mistaken, the city was under curfew at that time. We should not have been on the street. What would have happened if those good people (whom Guru Ji sent) had not met us? These are questions that have only occurred to me years later; at the time, and for some time after, I was in an altered state of consciousness where such things had no meaning. Indeed, the aftereffects of that spiritual state remain with me still. Why was I chosen for special treatment? I believe it had something to do with my brown hair, green eyes and fair skin. They must have believed that I would be the weak link in the chain. They were wrong. Among us, there were no weak links. As to the rest of my family that were taken that day, at their request, I have little to say except that the three of us got off much more lightly than they did.